Malic Acid, Silicon Dioxide, Natural and Artificial Flavors, Resistant Maltodextrin, Sucralose, Tartaric Acid, Salt, Acesulfame-Potassium, Gum Blend (Cellulose Gum, Xanthan Gum, Carrageenan), FD&C Red No. 40. Please read the entire directions before consuming and follow the tolerance assessment protocol. Assess your tolerance first by mixing 1 serving (1 scoop) with 8 oz. of cold water and consuming it about 30 minutes before your daily workout. Once tolerance has been assesed, increase the dosage to 2 scoops mixed with 16 oz. of water before working out. Do not exceed 2 scoops in a 24-hour period. Drink a glass of water daily for general good health. Not intended for use by persons under 18. Do not use if pregnant or nursing. One serving of this product contains up to as much caffeine as two cups of coffee. Caffeine-sensitive individuals may experience symptoms including (but not limited to) restlessness, nervousness, tremors, anxiety, increased heart rate and difficulty sleeping. Do not combine with other sources of caffeine or stimulants. Some individuals may experience a harmless tingling sensation from the concentrated performance dose of beta-alanine. Consult a medical doctor if you have a medical condition or before starting any diet or exercise program. KEEP OUT OF REACH OF CHILDREN. i Cholewa et al., 2013. Journal of the International Society of Sports Nutrition. 10:39.
ii Hoffman et al., 2009. Journal of the International Society of Sports Nutrition. 6:7. The 1g dose of taurine found in a full serving of Lab Series Pre-Build is clinically shown to improve performance in endurance athletes. This free-form amino acid is one of the most abundant amino acids in muscle and also aids in cell volumization. WHAT MAKES LAB SERIES SUPERIOR? MuscleTech researchers have taken an unparalleled leap in their commitment to supplement science by partnering with the Faculty of Kinesiology of the University of Toronto – an institutional leader with a long history of innovation and research – to support the MuscleTech Metabolism and Sports Science Lab. As part of the $58-million, state-of-the-art Goldring Centre for High Performance Sport of the University of Toronto, the partnership with the new lab reaffirms our devotion to developing ingredients with extreme efficacy validated by unbiased scientific research. The prestigious University of Toronto was recently ranked in the Top 20 for overall performance as stated in the Times Higher Education World University Rankings 2013–2014 report. The MuscleTech Metabolism and Sports Science Lab features novel technologies and equipment to carry out gold-standard research on new, emerging ingredients. As the first partnership of its kind, it is at the forefront of muscle physiology, sports performance and nutritional biochemistry. MuscleTech researchers’ passion and vision to continuously research, develop and patent the most effective sports supplements in the world has led to the MuscleTech Lab Series – a complete line of advanced products that promises extreme efficacy, with key ingredients validated by scientific research. MuscleTech Lab Series products are based on research from universities and third-party labs all around the world, including, what will be emerging research from the Metabolism and Sports Science Lab. MuscleTech Lab Series is the brand you can trust for superior science and superior results. Each bottle of MuscleTech Lab Series Pre-Build is fully disclosed with no proprietary blends, or hidden or underdosed key ingredients. 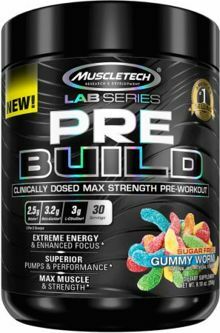 To ensure a high standard of quality and purity, each batch of MuscleTech Lab Series Pre-Build undergoes strict quality control and is third-party tested and verified to ensure that each bottle of meets the highest standards of purity, quality and consistency. As an athlete, we understand that one of your key concerns is knowing exactly what you put in your body. That’s why Team MuscleTech is committed to providing the highest quality scientifically formulated products that are free of banned substances. And that’s why each batch of MuscleTech Lab Series Pre-Build is guaranteed to be banned substance free so you can rest assured you’re taking only the best to be the best. MuscleTech researchers worked closely with industry-leading flavoring experts to guarantee that each high-quality serving of MuscleTech Lab Series Pre-Build delivers a mouthwatering flavor experience that will have you craving every serving! Gummy Worm This is a Buy 1 Get 1 FREE offer!